If you are a Singapore Citizen, the decision to buy a dwelling or to rent is quite straightforward. There is a strong culture as Singaporeans to buy your own dwelling and move out when you get married. The build to order scheme (BTO) provides subsidized housing that is relatively affordable for the citizens to put a roof over their heads. If you come to Singapore and currently hold a Singapore Permanent residency, you might want the same as well. The rules can be rather different for permanent residents. He have been working in Singapore in the finance sector for a while and his wife just join him this year. They are both under 30 and earning $5000 gross per month. They have been renting in Singapore for some time. Now he is thinking about whether he will be making a wrong choice thinking about buying a resale HDB flat. The biggest gripe for him is not having a settled feeling in this time renting a place to stay. He would like to know how I see the situation that he is in. I would consider settling down a rather big decision that should be discussed well. Not just that, there should be a clear thought process to weigh the pros and cons and the various scenarios that can be undertaken. The decision are most often limited by wealth, but we have to consider some of the qualitative or intangible considerations as well. I will go though how I think about his situation and also offer a simulation of buying versus renting of a prevalent dwelling for the typical Singapore household. One of the main consideration points is for the reader to get familiar with the property regulations. This relates to whether they are eligible for purchase, how much loan they can borrow, what kind of loan available. At this stage, doors might be open or close whether they meet the regulations. For starters, one main regulation enacted in 2013 is already working against them. Permanent Residents need to stay for 3 years before they can purchase a resale. To purchase resale flat, permanent residents need to pay 5% stamp duty. This eats into the costs which is why resale flats are preferred over private property. If permanent residents remain as permanent residents they cannot buy another private property when they hold on to a HDB flat. They have to sell the HDB flat. You need to fulfill a minimum occupation period (MOP) before you can sell. You cannot rent out the whole flat. It may be very harsh for me to task the couple with this task but if you decide to settle in the country for long, at least you need to see how it compares to other good countries to settle such as Canada, Australia and New Zealand. Does the couple require to build wealth through properties? This question is a big consideration because with a few property tightening measures, permanent residents will face some difficulty building wealth through properties. If they are to purchase a private property, there is no issue to have multiple properties, however, because you have to sell your HDB if you were to purchase a private property, you have to consider whether you would want to get a resale HDB flat or a private property. Getting a second property as an investment would mean paying a 10% Stamp Duty under current rules and a 25% down payment. 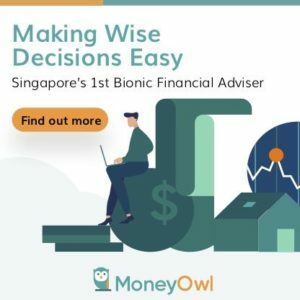 However, if you manage to convert to Singapore Citizen, after you purchase your HDB flat, you will not have that dilemma of choosing another way to build wealth. This would mean that you can co-own a HDB flat and a private property. A good perk for becoming a citizen! If we are deciding mainly from looking at property from an expense and subsistence perspective, there are a few benefits for renting instead of buying. For a couple that works in an industry that tends to work late, being able to live closer to their workplace in the central region can be more soothing for the morale. Studies have shown long commute is one of a reason for stress in people and relationships. It may be very costly to put down a downpayment to a property in a better location, but if you treat it as an expense, this offers you the choice to be more central. Renting allows you the optionality without overly invested in Singapore. It allows not just my friend but his wife, who have been here for a shorter period to see if this is a place to settle upon. A commitment to a HDB might mean difficulty, even an impossible task to sell the flat within 5 years which is a lengthy commitment. The last reason is a bit of speculation, in that there are much private and public housing supply coming online in 2015 and 2016. While the lease term for their current rental may not be completed, renting gives the ability to see and anticipate whether there are fire deals in the upcoming years. While my friend here is renting from a retail landlord, choosing to purchase a flat would mean a switch from the retail landlord to a bank or HDB. The mortgage that you pay is as if you are renting year by year from HDB or a bank for 25 years unless you chose to pay back early. Purchasing a home, if you cannot rent out is akin to renting with a call option, which you can exercise the call option should the strike price is above the call option price after a period of time. In Singapore, renting is not on par with mortgage loan. 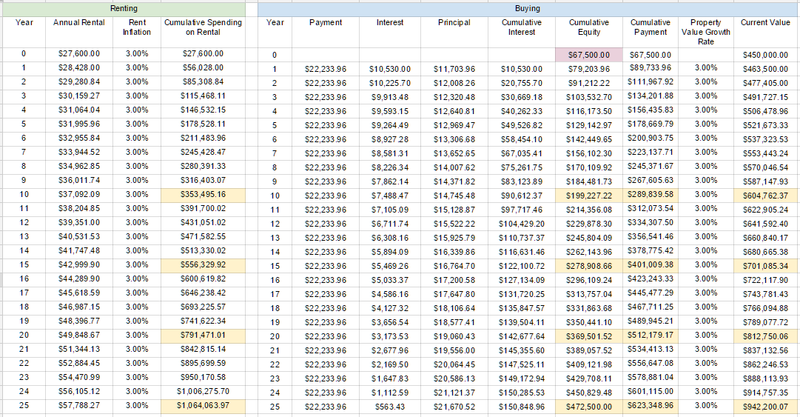 Rather renting a 4 room costs $2000 – $2300/mth while a 25 year $405,000 mortgage comes up to $1850/mth. The two costs look very close today but 1 year ago rentals would have been at $2600/mth. When mortgage is cheaper than renting, and that HDB loan have much benefits over bank loans particularly that your home would not be foreclosed, it makes it difficult to see Singaporean’s choosing to rent over buying a flat. One of the great stress that can equate to what you experience in war time is moving home. Some people take it in their stride, most people feel the stress over it. Landlords like to escalate rent, unless the landlord are wise enough to keep good tenants. Due to that you end up moving every 2 years. In some country, the rental duration can be longer, such as Germany and Japan. It makes forming a family much conducive. This would be one of the main considerations why my reader is seriously considering purchasing a flat. Having did a comparison of various positives and negatives, it would be clearer if we did a simulation of the monetary benefits and costs of renting versus buying. When you rent, the rent is likely to increase at its own inflation rate. We fixed this rental inflation rate at 3% per year. For 2, we assume the reader takes up a 25 year mortgage at a HDB rate of 2.6% interest. The downpayment for the place is $45,000 and we also add a 5% stamp duty to their cost, which comes up to an addition of $22,500. This total downpayment and stamp duty is reflected in the comparison table as cumulative equity, or how much existing principal value you have accumulated when you pay off your loan. We also tabulate the cumulative payment, which is the total amount over time that you have paid as downpayment, stamp duty, interest expense and principal. We also simulate the value of your home value that grows at an inflation rate of 3%. What we notice is that the total cumulative rental spending is always higher than the cumulative payment. This indicates that renting is over time always expensive, if the rental inflation is consistent at 3%. The advantage of buying the house is that over time the home value goes up. What my reader can do is use the table, to see how much gain at various junctures of 10 years, 15, 20, 25 years. What could change these figures? There are much assumptions in these figures, and that is where the results may be different. For one thing, the rental growth might be lesser or more than this simulation. The same can be said of the home value growth. If the reader compares between a rental in a more central location to this, the results will be the same. If the home purchase is a private property, then the results may vary. However, when I look at the results, it is hard to provide a case for renting in Singapore context because the rental cost at the start is much higher than the mortgage payment. This is unless current rental cost is vastly more expensive than historical which means that in the future the rental cost is lower than that of mortgage payment. For a couple that have been renting and sharing with people their living space, they may be able to carry out something that is uncomfortable for a lot of dwellers here, that is to rent out some of the rooms. Permanent Residents are not allowed to rent out the whole flat, but 1 room can bring in perhaps $600 which will bring down the mortgage cost from $1850/mth to $1250/mth. The main consideration in the reader choosing to rent versus buy here is likely to do with upfront cost, with a downpayment, renovation and stamp duty. It is something that have to be saved up. More of a consideration is whether they firmly want to set up shop in the country, whether the chances of gaining citizenship is there eventually and a good place to spread their roots. The monetary considerations seem to point that whether there is a stamp duty or not, renting is currently and will likely be more expensive in the future versus owning a HDB flat. Hope this helps him be a little bit clear on his thoughts and what he is looking for. Guys and gals, were you facing a similar situation as the couple? Looking back, what advice would you provide for the couple? Let me know if you have a question you wish me to address here. No stock tips! Hi Kyith, your assumption is that HDB will increase its value consistently over the years? What if it’s not and the lease running out? What would be your take after recent announcement or clarification from government on the lease matters? Hi Yim, you may be right. I think back then in 2015, the lease hold decay was not such a tough topic as today. However, you would have to see how long is the leasehold. the decay is not so fast in most cases although we are seeing prices affected by the demand and supply dynamics. If i didn’t answer your question do let me know. Thanks for your speedy reply, didn’t expect that. Yes you did answer my questions. How long the lease left that do you think it’s still worthwhile to buy. Recently been seeing many units prices especially those 20 plus to 30 plus old flats have been dropping since government clarified on the lease holding and announcing the new schemes. I think it would be really helpful to readers especially to this 2015 post, can be added some new updates or new consideration into account to guide the readers to make a better decision. Again, really appreciate your guidance and reply and congratulations to be selected top 10 personal financial blog. Keep up the good works. hi Yim, the record do not matter that much haha. i think i will try to update, but it seems the cut off is somewhere at the 20 year lease left part, that is when the appreciation outweights.